Tenerife is an island focused on tourism, so it's no wonder that as a tourist destination it has embraced quickly holidays such as Halloween. When you're on holiday somewhere, any reason to party and have more fun is quickly accepted. Do people get dressed up on Halloween in Tenerife? As the holiday has grown in popularity, more and more people have embraced it and get costumed. If you plan on attending a Halloween party you should get dressed up. Should you bring your costumes from home? You can, but it's not necessary, especially if you're staying in the Playa de las Americas area, where lots of shops sell costumes already. You will find kids costumes for Halloween, as well as costumes for adults in most of the Chinese shops at really good prices, so there's no need to stuff them in your suitcase, unless it's a really special costume. Are there any kids Halloween parties and activities organized? Large hotels will organize kids activities and parties as part of the daily entertainment. Many shopping malls will also organize activities for kids during the day, such as pumpkin carving, face painting and costume contests. Restaurants and bars may also organize activities during the daytime for kids, but they aren't usually advertised much in advance. Just get dressed up, go out and see what you can find. If you fancy carving your own pumpkins, you shouldn't have any trouble in finding those, especially in the big supermarkets (LIDL, Mercadona) and there may be some local shops in the South area (Playa de Las Americas, Costa Adeje, Los Cristianos) that will also stock pumpkins in the days before Halloween. Many bars, pubs and restaurants will host dedicated Halloween parties, especially in the tourist areas in the south. The club will be transformed and decorated throughout and the staff will get dressed up, making an unforgettable night with all the workers and residents of Tenerife joining in the night of mayhem. Zombies and ghouls will take over in Tramps after the sun goes down. The stuff of nightmares lurk around every corner as the dark of night washes over the club. See more details on their Facebook event page. This event was organized in 2017, but we have no info regarding a possible 2018 edition. 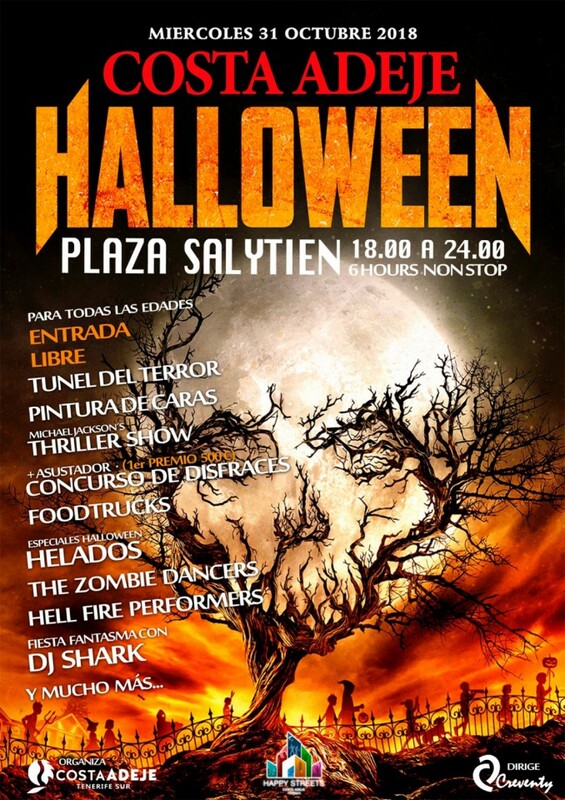 Its Coming.... Tenerife's Biggest Halloween Party! Get yourselves ready for this years theme which is 'The Rocky Horror Picture Show'. More info on their event page on Facebook. Each year Hard Rock Cafe Tenerife throws an amazing Halloween party as you can see from the clip below. See more details in the dedicated page on their website. This page will be updated with new Halloween events as soon as we get more info on what is happening in Tenerife on the most scary night of the year.